Laparoscopy Suction Irrigation Pumps are likely to remain the top selling product type, whereas developing economies are projected to demonstrate impressive revenue growth in coming years. Valley Cottage, United States - December 10, 2018 /MarketersMedia/ — Providing a brief overview of the FDA regulations for Class II medical devices such as endoscopes, a new study presented by Future Market Insights offers an exhaustive assessment of the global endoscopy fluid management systems landscape for a 10-year projection period, 2018-2028. According to the FMI study, as the Tier 1 players continue to contribute over 70% share of the market revenue, the global endoscopy fluid management systems landscape remains a highly consolidated space. The report covers extensive profiling of the top four performers including a few of the biggest industry names such as Stryker Corporation and Olympus Corporation. However, research indicates that even local players have strong penetration in regional markets. While a majority of companies are focusing on new product launches, strategic mergers and acquisitions are likely to emerge the most profitable developmental decisions in the near future. Most of these strategic moves will be primarily directed to address the high price point pressure associated with endoscopy fluid management systems that often affects revenue growth in developing economies. Major hospital networks in developed regional markets are witnessing M&A between hospitals, which is likely to shape costing of medical devices such as endoscopy fluid management systems – eventually slashing down the profitability margins of manufacturers. “Constantly increasing chronic disease instances, coupled with immense technological advances in the field of endoscopy, is prominently driving the US$ 342 Million market for endoscopy fluid management systems (or irrigation pumps) in recent years,” says a senior research analyst at the company. With maximum use in laparoscopic procedures, endoscopy fluid management systems continue to register maximum revenue generation through sales of laparoscopy suction irrigation pumps, followed by laparoscopy fluid management systems. Based on the modality of endoscopy fluid management systems, the Benchtop holds a substantial market value share. Hospitals register the highest consumption of endoscopy fluid management systems. Owing to a massive number of cancer survivors in the US, North America’s market for endoscopy fluid management systems is currently accounting for the largest revenue share in the global landscape, followed by Asia Pacific and Europe. MEA and Latin America are likely to represent a significant incremental opportunity, according to FMI study. APAC has become the hotspot for leading medical device companies, which is further intensified by dramatically growing medical tourism sector. Across APAC, Japan is likely to account for substantial revenue generation, enabling the regional market secure second spot in the global endoscopy fluid management systems landscape. FMI projects over 7% year on year revenue growth in 2020 and beyond, for this regional market. Latin American market for endoscopy fluid management systems is thriving at a promising pace owing to favorable government initiatives regarding endoscopic procedures and medical device marketing. Noteworthy demand for laparoscopy suction irrigation pumps within the region is identified to be responsible for the rapid revenue growth of endoscopy fluid management systems marketplace across Latin America. 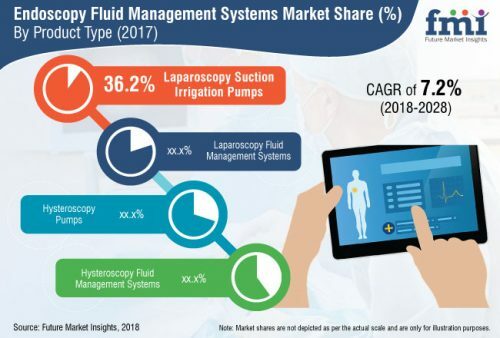 The market for endoscopy fluid management systems in MEA is prominently driven by the improving regulatory landscape related to the marketing of medical devices, pushed further by impressive sales of laparoscopy suction irrigation pump based endoscopy fluid management systems. FMI spots higher market attractiveness in Egypt owing to the presence of a large number of end users. However, poor operational environment still remains a major growth barrier for the region.